The vivo V15 Pro is the phone that brought the elevating selfie camera to the midrange. It borrowed the tech from the vivo NEX and was later followed by the Oppo F11 Pro. We reviewed the phone and have finally posted the video on our YouTube channel. The V15 Pro has a lot going on - Snapdragon 675 chipset, huge screen estate with no notches whatsoever, stunning colors on the back and a 48 MP camera. 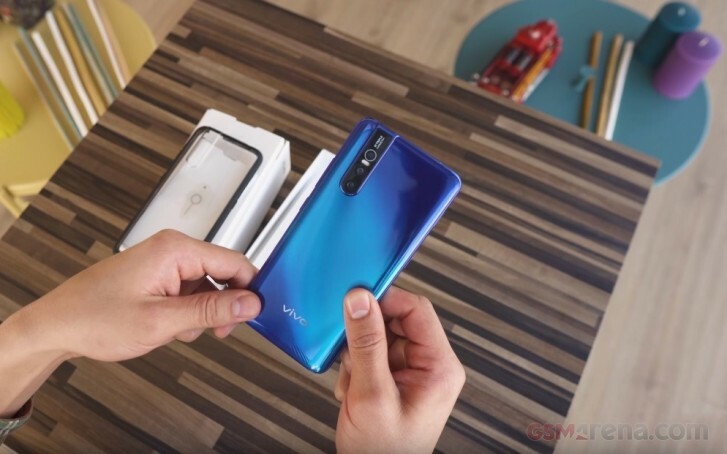 The manufacturer kept the under-display fingerprint scanner that made its way to the series back with the vivo V11 (or V11 Pro if you are in India). One of the biggest disappointments is the micro USB port. It should provide dual engine fast-charging, but our tests revealed only 38% charge of the 4,000 mAh power cell in 30 minutes. The UI is full of features, but its tendency to things the iOS way may not be everybody's cup of tea.